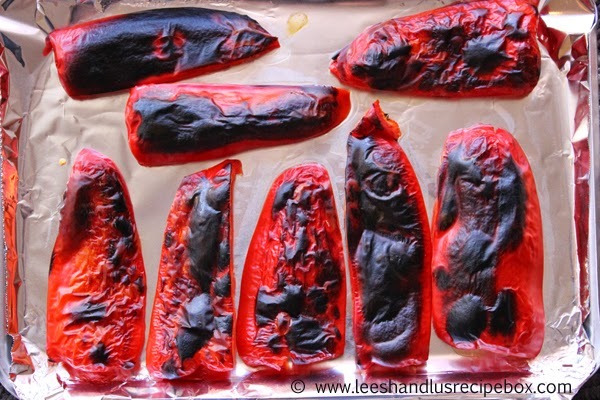 I love roasted red peppers! The sweet and smoky taste compliments so many things. Pizza, pasta, quesadillas, soup, salad, quiche, etc. The options are endless. Sometimes I buy them in a bottle, but when they are on sale and I have lots of things I want to make with them, roasting them at home seems to be the cheaper option. And since it's super easy, why not? So today I'm going to share with you a step by step picture on how to roast them in the oven. 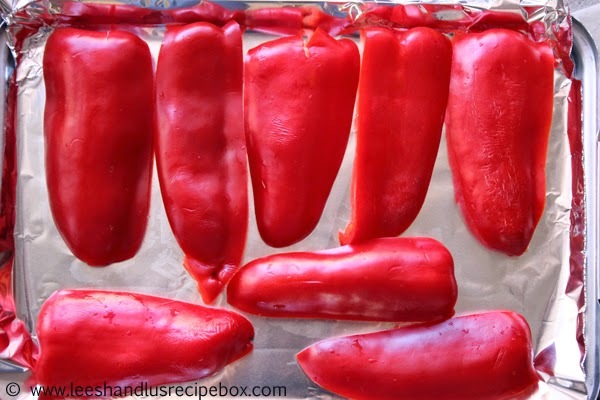 You can do as many peppers as will fit on a single layer of a baking sheet and fit under your broiler. Pictured here are just two peppers. 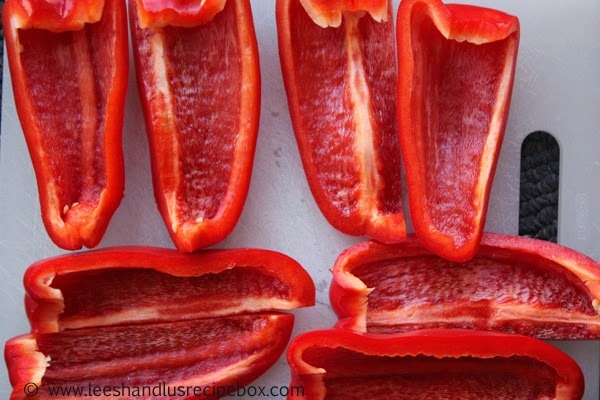 1) Wash the peppers, cut them into quarters and cut and rinse out all the seeds and membranes. Shake most of the water off of them over the sink. 2) Next you'll lay them with the insides face down on a foil lined baking sheet (here I used a 9x13 metal pan lid since I only had 2 peppers). You can press them so they lay as flat as possible. 3) Place them on the top rack of your oven and turn it to broil on low for 10-20 minutes or until the skin is black and the flesh is still moist and fork tender. You may want to rotate your pan part way through depending on how even your broiler is roasting them. *You can do this with any kind of pepper - but the thinner the skin and flesh the less time you'll want to broil. 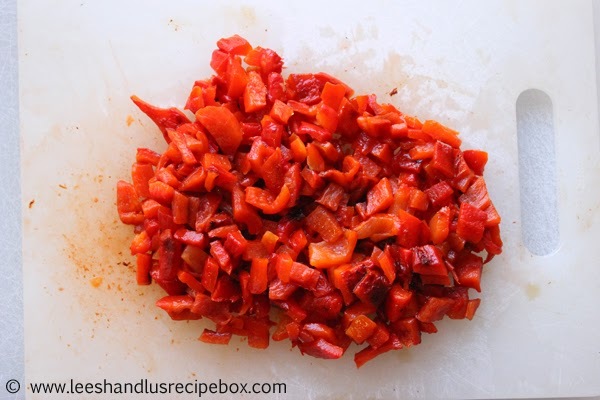 Red peppers are pretty thick when it comes to peppers. 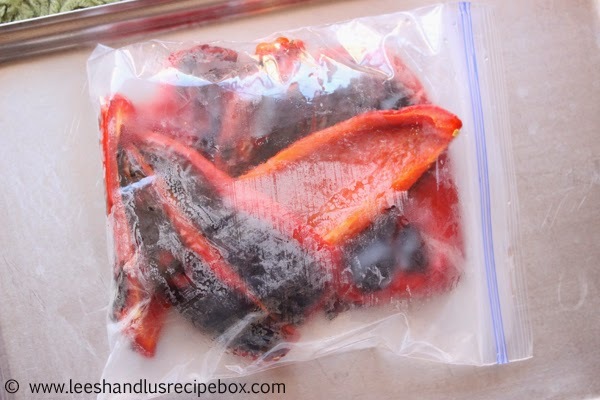 4) As soon as you remove them from the oven place them in a zip locking bag and let them sit for at least 10 minutes. As they steam in the bag the skins will loosen and will be really easy to peel off with your fingers or by softly scraping them with a knife. 5) After 10 minutes the skins should be able to be peeled or slid off with a knife quite easily. If not, then you probably didn't get them black enough. 6) Once they are all peeled you can chop/blend them up to use in whatever you want. If I don't use them all I freeze them in little snack size bags, putting about the amount I'd want for a meal in each bag and then putting the snack bags into a freezer bag. They thaw quickly on the counter or in warm water for quick and easy use. Here is a handy printable and all the instructions in one place without pictures. 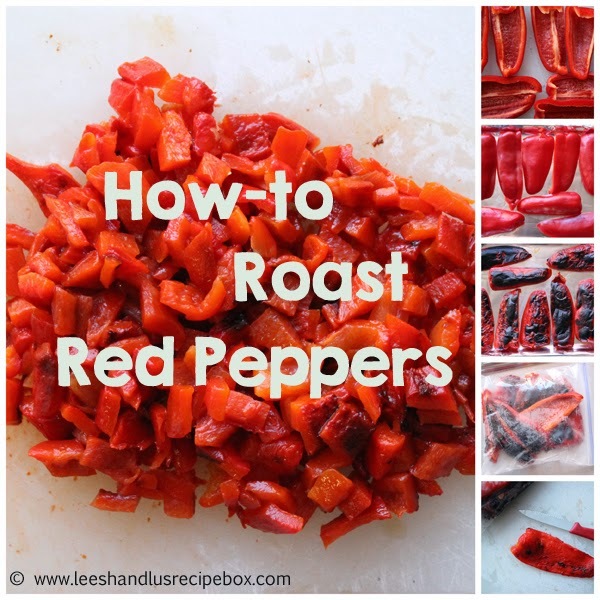 Hope you'll enjoy some roasted peppers! NOTE: *You can do this with any kind of pepper - but the thinner the skin and flesh the less time you'll want to broil. 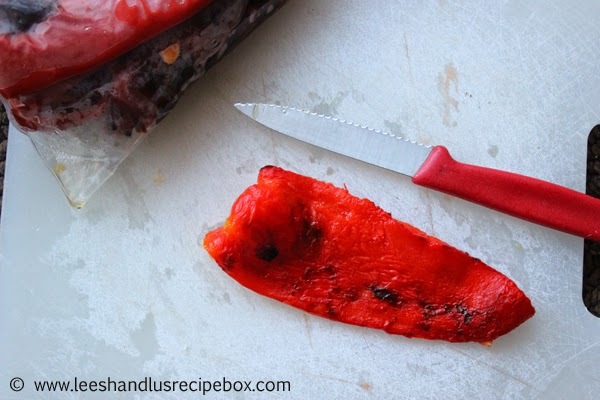 Red peppers are pretty thick when it comes to peppers. 1. Wash the peppers, cut them into quarters and cut and rinse out all the seeds and membranes. Shake most of the water off of them over the sink. 2. Next you'll lay them with the insides face down on a foil lined baking sheet (here I used a 9x13 metal pan lid since I only had 2 peppers). You can press them so they lay as flat as possible. 3. Place them on the top rack of your oven and turn it to broil on low for 10-20 minutes or until the skin is black and the flesh is still moist and fork tender. You may want to rotate your pan part way through depending on how even your broiler is roasting them. 4. As soon as you remove them from the oven place them in a zip locking bag and let them sit for at least 10 minutes. As they steam in the bag the skins will loosen and will be really easy to peel off with your fingers or by softly scraping them with a knife. 5. After 10 minutes the skins should be able to be peeled or slid off with a knife quite easily. If not, then you probably didn't get them black enough. 6. Once they are all peeled you can chop/blend them up to use in whatever you want. If I don't use them all I freeze them in little snack size bags, putting about the amount I'd want for a meal in each bag and then putting the snack bags into a freezer bag. They thaw quickly on the counter or in warm water for quick and easy use. Similar methods as seen on here and here. Yum! I have done this with anaheim peppers when making chili verde but haven't thought of doing this for red peppers. Thanks for the tip!